Have your logo stand out with these high quality jute shopping bags! Production time: Usually 10-15 working days after artwork approval. The perfect companion for shopping at the local markets or even as an everyday tote. These farmers market bags are high end, featuring exceptional build quality to provide superior strength and longevity. The bags have an inside lining, giving the bag a more solid structure as well as soft natural cotton handles and an expandable base gusset. 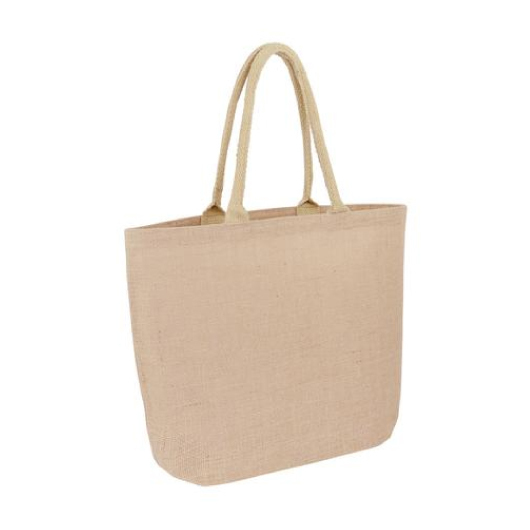 Say no to plastic bags and YES to these jute shopping bags today! Discounts available on offshore production (over 1000 units).